If you are inviting people over for a get-together, it’s always nice to have a fun drink on hand to celebrate. 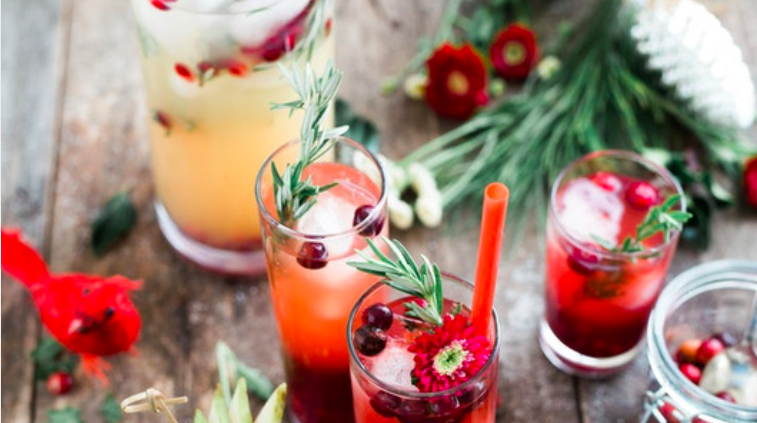 The following are a few drink ideas to celebrate the holidays without the effects of alcohol. Cran-Raspberry Martini: This makes a festive red drink. Run a slice of lime around the rim of a martini glass. Dip glass into sugar. Shake crushed raspberries with leftover lime juice and ice. Add cranberry juice and sparkling water to raspberry-lime mixture. Drain raspberry puree and ice. Pour remaining liquid into glass and garnish with whole raspberries. Apple Pie-Spiced Spider: This recipe will have your whole place smelling great. Stir together 1 1/4 quarts apple cider, 3 tbsp. brown sugar, 1 cinnamon stick, 1 tsp. allspice, 1/2 tsp. ground ginger, ground cloves, freshly grated nutmeg, and a pinch of salt. Bring to a simmer. Discard solids. Pour into warm mugs and add cinnamon sticks for decoration and flavor. Peppermint Hot Chocolate: Add 1/3 cup unsweetened cocoa powder to saucepan. Slowly stir in 1 quart milk until cocoa is dissolved. Add 1/2 cup semisweet chocolate chips and 1/4 cup crushed peppermint. Stir until chocolate and peppermint are both melted. Bring to boil and then remove from heat. Add a pinch of sea salt. Pour into warm mugs and serve with whipped cream, a peppermint stick and chocolate shavings. Sparkling Breakfast Punch: This drink is great for morning get-togethers. Prepare ahead of time, and it’s easy to do the rest before serving. Stir together 3 cups orange juice, 2 cups pineapple juice, and 3 cups pomegranate juice in a large bowl. Cover and refrigerate at least two hours. Right before serving, stir in 1 liter ginger ale and 1 liter club soda, chilled. Pour over ice in glasses. Candy Crush: This is a great drink for children and any other guests with a sweet tooth. Add gummy bears or rock candy to a plastic champagne flute. Then pour a light-colored sparkling juice into the plastic champagne flute. It’s always a good time for a drink at Gramercy on the Park Apartments in Dallas. Conveniently located between Plano and Dallas, it’s a great place to come home to. Call us today to find out which floor plans we have available.